The establishment of a Confucius Institute at the University of Ulster will foster a deeper understanding and stronger relationship between Northern Ireland and China, the Chinese Vice Minister of Education claimed today. 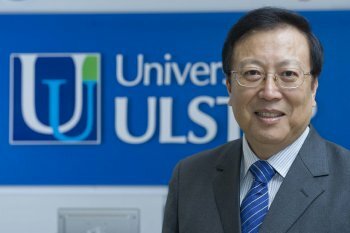 During a visit to the Belfast city centre campus where he was briefed on plans for a week of Chinese cultural events in April marking the formal launch of the Confucius Institute of Northern Ireland at the University of Ulster (CINIU), Vice Minister Hao Ping (pictured) claimed both countries could reap a number of benefits from its establishment. "I think the establishment of the Confucius Institute here at Ulster will provide a platform for students in Northern Ireland and also students in the United Kingdom to learn about Chinese language, Chinese culture, Chinese history and the arts," the Vice Minister said. "At the same time we would like it to serve as a platform for Chinese young people to understand about Northern Ireland, your culture, your history and education system. This is a platform for mutual understanding and learning. "I think your university will play a key role in the establishment of the Confucius Institute. At the same time we would like to see the University of Ulster establish research institutes in Chinese universities to help bring your culture, your social development, your economy to China. "It is all about learning from each other and collaboration with each other and also making progress together with each other." It was announced last September that Hanban, an offshoot of the Chinese Ministry of Education, had sanctioned the setting up of Northern Ireland's only Confucius Institute at the University of Ulster. With headquarters at the Coleraine campus and offices on its Belfast city centre campus, CINIU is a collaboration with Zhejiang University of Media and Communications in southeastern China. CINIU will not be solely focussed on the teaching of Mandarin Chinese. Like the 350 other Confucius Institutes operating in universities in 105 countries, CINIU will encourage private and public sector companies and organisations wishing to trade and engage with China to study not only the language but the business and administrative culture, its customs and practices to gain a competitive advantage. In December CINIU also announced it had entered into a partnership with Hubei Normal University in eastern China to promote the training of primary and secondary school teachers in Northern Ireland to teach the Chinese language, history and culture to their pupils. The agreement will also facilitate artistic, cultural and academic exchanges between China and Northern Ireland. The Vice Minister and representatives from the Chinese Ministry of Education, the Ministry of Foreign Affairs, Chinese Embassy and from Zhejiang University of Media and Communications were welcomed to the Belfast campus by its Provost, Professor Alastair Adair who is also the Pro-Vice-Chancellor of Communication and Development and Professor Pol O Dochartaigh, the Dean of the Faculty of the Arts. Professors Adair and O Dochartaigh took the delegation on a tour of the existing campus, briefed the Vice Minister on plans for a new city centre campus and on the official launch of CINIU which will see a week of events in April in venues across Ulster's four campuses and also off campus celebrating Chinese arts, sport, business and culture. Professor Alastair Adair commented: "The University is very honoured to have been chosen to establish Northern Ireland's only Confucius Institute which we believe will become a vital link academically, culturally and economically for the fostering of closer ties between Northern Ireland and China. "We are delighted to have hosted the Vice Minister and his delegation today, to have shown them the state of the art learning facilities that already exist on our Belfast campus, including the digital animation lab where Visual Communications Professor Greg Maguire, who worked on 'Avatar', is passing on his skills to students. We were also pleased to brief the delegation on our exciting plans for an enlarged city centre campus with cutting edge higher education facilities. "We are delighted with our design which will be launched later this week and are excited about our links to Zhejiang University of Media and Communication and also Hubei Normal University. We believe not only will Northern Ireland students and staff benefit greatly from the new facility but also our international exchange students and staff, especially those from China. "These are exciting days at the University of Ulster and we are delighted that our partners in China will be involved. We look forward to developing further what is already proving to be a strong and fruitful partnership."